The Roman Senator Nonius chose exile “turned out of house and home” rather than surrender a large opal ring to Marc Antony. Pliny the Elder (Plinii), Roman officer and author of the Natural History (Naturalis historia) wrote of the opalus: "There exists today a gem of this kind, on account of which the senator Nonius was proscribed by Antony. Seeking safety in flight, he took with him of all his possessions this ring alone, which it is certain, was valued at 2,000,000 sesterces (USD$80,000)." The opalus was "as large as a hazel-nut." In the mid-18th Century, a peasant found a brilliant precious stone in an old ruins at Alexandria, Egypt. 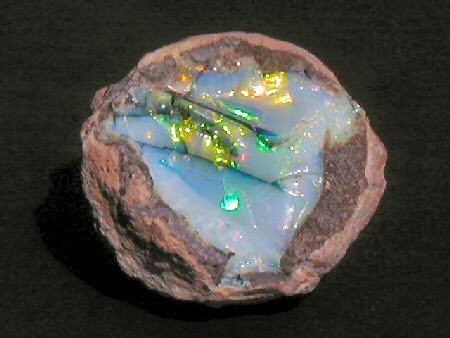 This stone was set in a ring and is said to have been an opal cut en cabochon and "as large as a hazel-nut." The ring was taken to Constantinople, where it was estimated to be worth "several thousand ducats." (Hesselquist, "Voyages and Travels in the Levant" 1766.) The description of this gem, its apparent antiquity and the high value placed on it have led many to ponder wheteher it was the celebrated "Opal of Nonius." In 'Naturalis historia' Pliny wrote that opal was the most highly prized and valuable of all gemstones in the Roman Empire and that price was set “according to the decree generally set down and pronounced by our nice and costly dames”! Pliny was an obvious admirer of opals: "For in them you shall see the living fire of ruby, the glorious purple of the amethyst, the sea-green of the emerald, all glittering together in an incredible mixture of light." Another translation of the Pliny text reads: "There is in them a softer fire than in the carbuncle, there is the brilliant purple of the amethyst; there is the sea-green of the emerald -- all shining together in incredible union. Some by their refulgent splendor rival the colors of the painters, others the flame of burning sulphur or of fire quickened by oil."